Even though life expectancy is rising in most OECD countries, participation rates for older workers remain low. The fact that a non-negligible fraction of individuals exit the labor force well before retirement age has grave economic consequences, as it influences the economic dependency ratio of a country, that is, the ratio of retirees and unemployed over the employed. Among the less noted factors that affect early retirement is technical progress. In a new research paper published in the IZA Journal of Labor Policy, Lorenzo Burlon (Bank of Italy and IZA) and Montserrat Vilalta-Bufí (University of Barcelona) reexamine the effect of technical progress on early retirement in the US. They find that technical progress affects early retirement in two opposing ways. On the one hand, it increases real wages and thus produces an incentive to postpone retirement, while on the other hand, it erodes workers’ skills, making early retirement more likely. The researchers use US data from the Health and Retirement Study (HRS), a survey that follows about 37,000 adult individuals for 10 biennial waves between 1992 and 2010 and provides retrospective information on their job history. They merge this with individual data from US World KLEMS, a database that provides information on output, inputs and productivity at a detailed industry level. That way the authors are able to associate each individual with the technical change he or she must have faced during the period of observation. After the combination of these two datasets, Burlon and Vilalta-Bufí calculate how technical change affects the probability to retire early and compare the results to those obtained with other measures of technical change. They find that the effect of technical change on the probability of early retirement changes depending on the degree of technical change. When technical change is fast, it will cause more people to retire early, because elderly workers find it difficult to adapt to the new, more technical job environment. As their skills become more and more obsolete they are more likely to retire early. However, the authors notice that once a certain degree of technical change has been reached, the probability to retire early decreases again. They put the threshold of technical change at around 85%, above which early retirement depends negatively on technical change. They explain this with the fact that a large degree of technical change also has a large positive effect on wages. Faced with these large pecuniary incentives, workers are more likely to adapt to the new working environment, learn new skills and retire later. 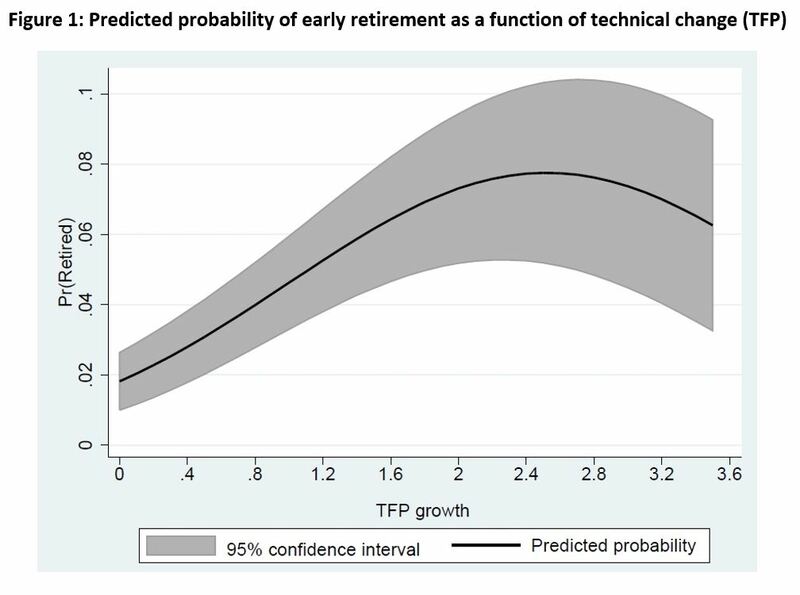 Overall, the study thus reports a U-shaped relation between technical change and the probability of early retirement (see figure below). To verify their findings, the authors also performed various robustness checks and were able to exclude alternative explanatory factors. The findings by Burlon and Vilalta-Bufí suggest that the higher the technical change, the more willing the elderly are to retrain, an insight which should be taken into account by policy makers. 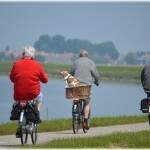 In the context of an aging society, the authors propose that policies should aim at delaying retirement and stimulate the participation of the elderly to the labor force. For example, an increase in workers’ working horizon can stimulate the elderly’s labor force participation. Particularly in sectors with larger technical change, individuals are more inclined to take up training programs and delay retirement, so that training policies for the elderly become more effective.